Louis-Jacques-Mande Daguerre (18 November 1787 - 10 July 1851) was the French artist and chemist who is recognized for his invention of the Daguerreotype process of photography. He announced its perfection in 1839 after years of experimentation, with the French Academy of Sciences announcing the process on January 9 of that year. Daguerre's patent was acquired by the French Government, and on 19 August 1839 the French Government announced the invention was a gift "Free to the World." W. Villiger discovered asteroid #428 Monachia. A. Schwassmann discovered asteroid #989 Schwassmannia. Alan Bartlett Shepard, Jr. (18 November 1923 - 21 July 1998) (Rear Admiral, USN, Ret.) was the first U.S. astronaut in space. Shepard was one of the Mercury astronauts named by NASA in April 1959 to Project Mercury, and he holds the distinction of being the first American to journey into space. On 5 May 1961, in the Freedom 7 spacecraft, he was launched by a Redstone rocket on a ballistic trajectory suborbital flight which carried him to an altitude of 116 statute miles and to a landing point 302 statute miles down the Atlantic Missile Range. Shepard was scheduled to pilot the Mercury-Atlas 10 Freedom 7-II, three day extended duration mission in October 1963. The MA-10 mission was cancelled on 13 June 1963. After the Mercury-Atlas 10 mission was cancelled in June 1963, Shepard was designated as the command pilot of the first manned Gemini mission. Frank Borman was picked as his co-pilot. Gus Grissom and John Young took over the mission when Shepard became ill and was removed from flight status. Also in 1963, Shepard was designated Chief of the Astronaut Office with responsibility for monitoring the coordination, scheduling, and control of all activities involving NASA astronauts. In early 1964, Shepard was diagnosed with Meniere's disease, a condition in which fluid pressure builds up in the inner ear. This syndrome causes the semicircular canals and motion detectors to become extremely sensitive. It results in disorientation, dizziness and nausea. This condition caused him to be removed from flight status for most of the 1960's. He was restored to full flight status in May 1969, following corrective surgery (using a newly developed method) for Meniere's disease. At age 47, and the oldest astronaut in the program, Shepard made his second space flight as spacecraft commander on Apollo 14, 31 January - 9 February 1971. He was accompanied on man's third Lunar landing mission by Command Module pilot Stuart Roosa and Lunar Module pilot Edgar Mitchell. Maneuvering their Lunar module, "Antares," to a landing in the hilly upland Fra Mauro formation on the Moon, Shepard and Mitchell subsequently deployed and activated various scientific equipment and experiments and collected almost 100 pounds (45 kg) of Lunar samples for return to Earth. Shepard was also notable for being the only person to play golf on the Moon (using a converted soil sampler as his club). Shepard died 21 July 1998 from complications of lukemia at his home in Pebble Beach, California. William J. "Pete" Knight (19 November 1929 - 7 May 2004) was an American aeronautical engineer, NASA test pilot and astronaut in the X-20 and X-15 programs, USAF combat pilot in the Vietnam War, and a politician in California. Knight holds the world's speed record for flight in a manned winged, powered aircraft, set 3 October 1967 when he piloted the X-15A-2 to 4,520 miles per hour (7,274 km/h) (Mach 6.72). As of 2017, the record stands unbroken. In 1960, Knight was one of six test pilots selected to fly the X-20 Dyna-Soar, which was planned to be the first winged orbital space vehicle capable of lifting reentries and conventional landings. After the X-20 program was canceled in 1963, he completed the astronaut training curriculum of the Aerospace Research Pilot School at Edwards AFB and was selected to fly the North American X-15. Another adventure Knight had in the X-15 occurred on 29 June 1967 during X-15 flight # 184: While climbing through 107,000 feet (32.613 km) at Mach 4.17, the X-15 suffered a total electrical failure and all onboard systems shut down. After reaching a maximum altitude of 173,000 feet (52.730 km), he calmly set up a visual approach and, resorting to old-fashioned "seat-of-the-pants" flying, he glided down to a safe emergency landing at Mud Lake, Nevada. For his remarkable feat of airmanship that day, he earned a Distinguished Flying Cross. L. Boyer discovered asteroid #1364 Safara. L. Oterma discovered asteroid #1522 Kokkola. Died, Walther Nernst, German physicist (heat theorem: the Third Law of Thermodynamics, electrochemistry, and more), Nobel 1920, chemistry, "in recognition of his work in thermochemistry"
Lt. Col. Frank K. "Pete" Everest completed the first powered flight of the Bell X-2 rocket plane. NASA launched the Ranger 2 Lunar test flight which failed to leave Earth orbit because of a failed gyro in the booster. 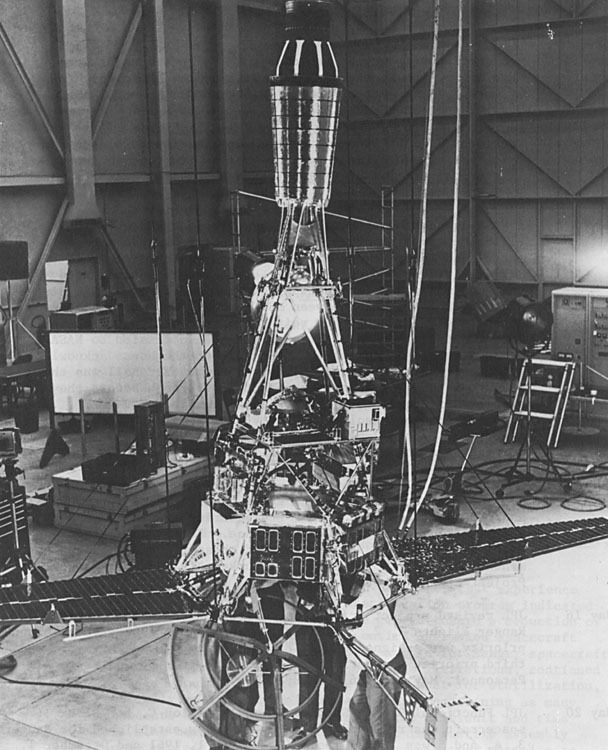 Ranger 2 was launched into a low Earth parking orbit on 18 November 1961. The spacecraft was a flight test of the Ranger spacecraft system designed for future Lunar and interplanetary missions. Ranger 2 was designed to test various systems for future exploration and to conduct scientific observations of cosmic rays, magnetic fields, radiation, dust particles, and a possible hydrogen gas "tail" trailing the Earth. Following its launch into orbit, an inoperative roll gyro prevented the Agena booster from being restarted. Consequently, the spacecraft could not be put into its planned deep-space trajectory, resulting in Ranger 2 being stranded in low Earth orbit upon separation from the Agena stage. The orbit decayed and the spacecraft reentered Earth's atmosphere on 20 November 1961. Died (at Copenhagen, Denmark), Niels Bohr, physicist, Nobel Prize in Physics 1922 "for his services in the investigation of the structure of atoms and of the radiation emanating from them"
Niels Henrik David Bohr (7 October 1885 - 18 November 1962) was a Danish physicist who made essential contributions to understanding atomic structure and quantum mechanics. He received the Nobel Prize in Physics 1922 "for his services in the investigation of the structure of atoms and of the radiation emanating from them." # Bohr's model of atomic structure. # The theory that electrons travel in orbits around the atom's nucleus, with the chemical properties of the element being largely determined by the number of electrons in the outer orbits. # The idea that an electron could drop from a higher-energy orbit to a lower one, emitting a photon (light quantum) of discrete energy (this became the basis for quantum theory). # The Copenhagen interpretation of quantum mechanics. # The principle of complementarity: that items could be separately analyzed as having several contradictory properties. AT&T introduced touch-tone service as an option in two Pennsylvania cities, making push-button dialing a commercial reality for consumers. NASA Apollo 12 entered Lunar orbit during the second manned mission which landed humans on the Moon. Apollo 12, launched on 14 November 1969 under cloudy, rain-swept skies, was the second mission in which humans walked on the Lunar surface and returned to Earth. On 19 November 1969, two astronauts (Apollo 12 Commander Charles P. "Pete" Conrad and LM Pilot Alan L. Bean) landed on the Moon in the Lunar Module (LM) within walking distance (182.88 meters) of Surveyor 3, in Oceanus Procellarum (Ocean of Storms). Meanwhile, the Command and Service Module (CSM) continued in Lunar orbit with CM pilot Richard F. Gordon aboard. During their stay on the Moon, the astronauts examined Surveyor 3 (which had landed on the Moon 2.5 years earlier, on 20 April 1967) and removed pieces for later examination on Earth, set up scientific experiments, took photographs, and collected Lunar samples on two moonwalk EVA's. The LM took off from the Moon on 20 November, and the astronauts returned to Earth on 24 November. Apollo 12 was launched on Saturn V SA-507 on 14 November 1969 at 16:22:00 UT (11:22:00 AM EST) from Pad 39A at Kennedy Space Center. The spacecraft was struck by lightning 36 seconds after launch and again 52 seconds after launch, which momentarily shut off electrical power and cut out telemetry contact. The first strike was visible to spectators at the launch site. Power was automatically switched to battery backup while the crew restored the primary power system. There were no further problems with the power system and the spacecraft entered planned Earth parking orbit at 11 minutes 44 seconds after liftoff. After 1.5 orbits, the S-IVB stage was re-ignited at 19:15:14 UT for a translunar injection burn of 5 minutes 45 seconds, putting the spacecraft on course for the Moon. The CSM separated from the S-IVB stage containing the LM 25 minutes later, turned around and docked with the LM at 19:48:53 UT. After achieving trajectory towards the Moon, the LM and CSM decoupled from the S-IVB at 20:35 UT on 14 November 1969 and made a course correction to head for Lunar orbit. Propellants were fired to target the SIVB stage past the Moon and into solar orbit, but the stage did not go close enough to the Moon to permit escape, and it ended in a highly elliptical Earth orbit due to an error in the instrument unit. During Lunar coast, the LM was checked out to ensure no electrical damage had been caused by the lightning. Astronauts Conrad and Bean transferred to the LM one-half hour earlier than planned in order to obtain full TV coverage through the Goldstone tracking station. The 56-minute TV transmission showed excellent color pictures of the CSM, the intravehicular transfer, the LM interior, the Earth, and the Moon. A midcourse correction was made on 16 November at 02:15 UT. A six minute SPS burn on 18 November at 03:47:23 UT put the Apollo 12 into Lunar orbit of 312.6 x 115.9 kilometers. Two orbits later, a second burn circularized the orbit with a 122.5 kilometer apolune and a 100.6 kilometer perilune. Conrad and Bean again entered the LM, where they perfomed housekeeping chores, a voice and telemetry test, and an oxygen purge system check. They then returned to the CM. Conrad and Bean entered the LM, checked out all systems, and separated from the CSM at 04:16:03 UT on 19 November with a reaction control system thruster burn. The LM descent engine fired for 29 seconds at 05:47 UT, and the LM landed at 06:54:35 UT (1:54:35 a.m. EST) in the Oceanus Procellarum area at 3.0124 S latitude, 23.4216 W longitude (IAU Mean Earth Polar Axis coordinate system) within about 180 meters of the Surveyor 3 spacecraft. Conrad and Bean took two moonwalks with a total duration of 7 hours 45 minutes, covering a total traverse distance of 1.35 km. The first was from 11:32:35 to 15:28:38 UT and involved deployment of the ALSEP. Conrad, shorter than Neil Armstrong (first man on the moon, 20 July 1969), had a little difficulty negotiating the last step from the LM ladder to the Lunar surface. When he touched the surface at 6:44 AM EST on 19 November, he exclaimed, "Whoopee! Man, that may have been a small step for Neil, but that's a long one for me." Bean joined Conrad on the surface at 7:14 AM EST. They immediately collected a 1.9 kilogram contingency sample of Lunar material, and later a 14.8 kilogram selected sample. They also deployed an S-band antenna, solar wind composition experiment, and the American flag. An Apollo Lunar Surface Experiments Package with a SNAP-27 atomic generator was deployed about 182 meters from the LM. After 3 hours 56 minutes on the Lunar surface, the two astronauts entered the Intrepid to rest and check plans for the next EVA. To improve the television pictures from the Moon, a color camera was taken on Apollo 12, unlike the monochrome camera used on Apollo 11. Unfortunately, when Bean carried the camera to the place near the Lunar Module where it was to be set up, he inadvertently pointed it directly into the Sun, destroying the vidicon tube. Television coverage of this mission was thus terminated almost immediately. The Apollo Lunar Surface Experiments Package (ALSEP) consisted of a set of scientific instruments emplaced at the landing site by the astronauts. The instruments were arrayed around a central station which supplied power to run the instruments and relayed data collected by the experiments to Earth. The central station was a 25 kg box with a stowed volume of 34,800 cubic cm. Thermal control was achieved by passive elements (insulation, reflectors, thermal coatings) as well as power dissipation resistors and heaters. Communications with Earth were achieved through a 58 cm long, 3.8 cm diameter modified axial-helical antenna mounted on top of the central station, pointed towards Earth by the astronauts. Transmitters, receivers, data processors and multiplexers were housed within the central station. Data collected from the instruments were converted into a telemetry format and transmitted to Earth. The ALSEP system and instruments were controlled by commands from Earth. The uplink frequency for all Apollo mission ALSEP's was 2119 MHz, the downlink frequency for the Apollo 12 ALSEP was 2278.5 MHz. All ALSEP instruments were deployed on the surface by the astronauts and attached to the central station by cables. The Apollo 12 ALSEP instruments consisted of: (1) a passive seismometer, designed to measure seismic activity and physical properties of the Lunar crust and interior; (2) a suprathermal ion detector, designed to measure the flux, composition, energy, and velocity of low-energy positive ions; (3) a cold cathode ion gauge, designed to measure the atmosphere and any variations with time or solar activity such atmosphere may have; (4) a Lunar dust detector, to measure dust accumulation, radiation damage to solar cells, and reflected infrared energy and temperatures; (5) a Lunar surface magnetometer (LSM), designed to measure the magnetic field at the Lunar surface; and (6) a solar wind spectrometer, which measured the fluxes and spectra of the electrons and protons that emanate from the Sun and reach the Lunar surface. The central station, located at 3.0094 S latitude, 23.4246 W longitude, was turned on at 14:21 UT on 19 November 1969 and shut down along with the other ALSEP stations on 30 September 1977. On the second moonwalk, on 20 November from 03:54:45 to 07:44:00 UT, Conrad and Bean retrieved the Lunar module TV camera for return to Earth for a failure analysis, obtained photographic panoramas, core and trench samples, a Lunar environment sample, and assorted rock, dirt, bedrock, and molten samples. The crew then examined and retrieved about 10 kg of parts of Surveyor 3, including the TV camera and soil scoop. After 3 hours 49 minutes on the Lunar surface during the second EVA, the two crewmen entered the LM at 2:44 AM EST on 20 November. Meanwhile, astronaut Gordon, orbiting the moon in the Yankee Clipper, had completed a Lunar multispectral photography experiment and photographed proposed future landing sites. The LM lifted off from the Moon on 20 November at 14:25:47 UT after 31 hours 31 minutes on the Lunar surface with 34.4 kilograms of Lunar samples. Rendezvous maneuvers went as planned. The last 24 minutes of the rendezvous sequence was televised. After docking with the CSM at 17:58:22 UT, the crew transferred the samples, equipment, and film to the Yankee Clipper. The LM was jettisoned at 20:21:30 and intentionally crashed into the Moon at 22:17 UT (5:17 PM EST), striking at 3.94 S, 338.80 E, about 72.2 kilometers southeast of the seismic station at the Apollo 12 landing site, creating the first recorded artificial moonquake. The seismometers the astronauts had left on the Lunar surface registered the vibrations for more than an hour. Transearth injection began at 20:49:16 UT on 21 November with a firing of the CSM main engine after 89 hours 2 minutes in Lunar orbit. During the transearth coast, views of the receding Moon and the interior of the spacecraft were televised, and a question and answer session with scientists and the press was conducted. A mid-course correction was made on 22 November. The CM separated from the SM on 24 November at 20:29:21. Apollo 12 splashed down in the Pacific Ocean on 24 November 1969 at 20:58:24 UT (3:58:24 PM EST) after a mission elapsed time of 244 hours, 36 minutes, 24 seconds. The splashdown point was 15 deg 47 min S, 165 deg 9 min W, near American Samoa and 6.9 km (4.3 mi) from the recovery ship USS Hornet. Performance of the spacecraft, the first of the Apollo H-series missions, was very good for all aspects of the mission. The primary mission goals of an extensive series of Lunar exploration tasks, deployment of the ALSEP, and demonstration of the ability to remain and work on the surface of the Moon for an extended period were achieved. Conrad was a Navy Commander on his third spaceflight (previously on Gemini 5 and 11, later to fly on Skylab 2), Bean was a Navy Lt. Commander on his first flight (he later flew on Skylab 3), and Gordon was a Navy Commander on his second flight (Gemini 11). The backup crew for this mission was David Scott, Alfred Worden, and James Irwin. The Apollo 12 Command Module "Yankee Clipper" is on display at the Virginia Air and Space Center in Hampton, Virginia. The returned Surveyor 3 camera is on display at the Smithsonian Air and Space Museum in Washington, DC. Felix Aguilar Observatory discovered asteroid #2507 Bobone. Purple Mountain Observatory discovered asteroid #3136; T. Furuta discovered asteroid #2908 Shimoyama. NASA STS 74 (Atlantis 15, Shuttle 73) undocked from the Russian Mir space station during the second Shuttle-Mir docking mission.